• Unread SMS provides the number of unread messages, not unread conversations. 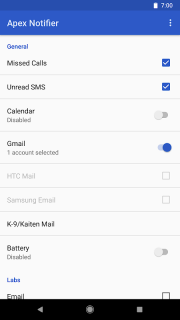 • Gmail unread count requires Gmail version 4.0.5 or higher. 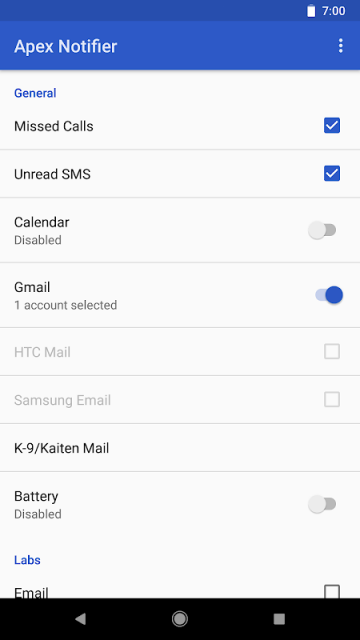 • If you update Gmail or install K-9/Kaiten Mail after installing Apex Notifier, you may have to re-install Apex Notifier to get proper permissions. • Notification data for Email, Google Voice, and Starbucks are retrieved from widgets. Please set up your account in those apps first. Depending on how often each app refreshes its widget, data may not be updated in real time. • Features listed under Labs are experimental and may stop working in the future. 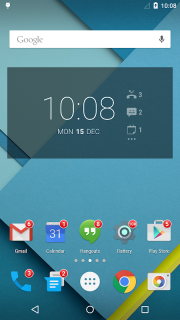 • Please install Apex Launcher before installing Apex Notifier. • Apex Notifier only works with official versions of Apex Launcher Pro. Please do not ask for support if you are using a modified or pirated version. For now, only apps listed above are supported. Integration with additional apps may be implemented in the future if there is official API or public content provider. Doesn't work anymore with Android 4.3.